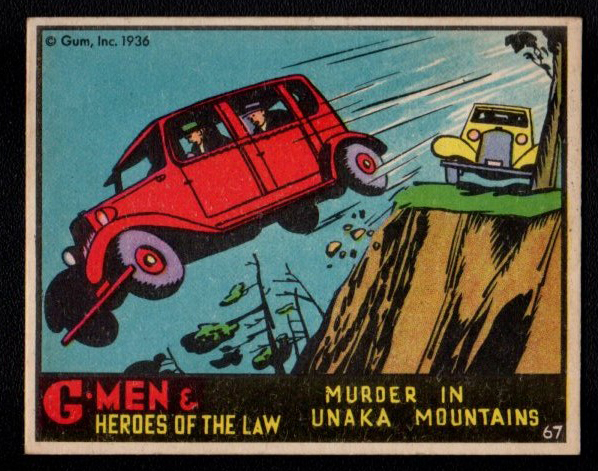 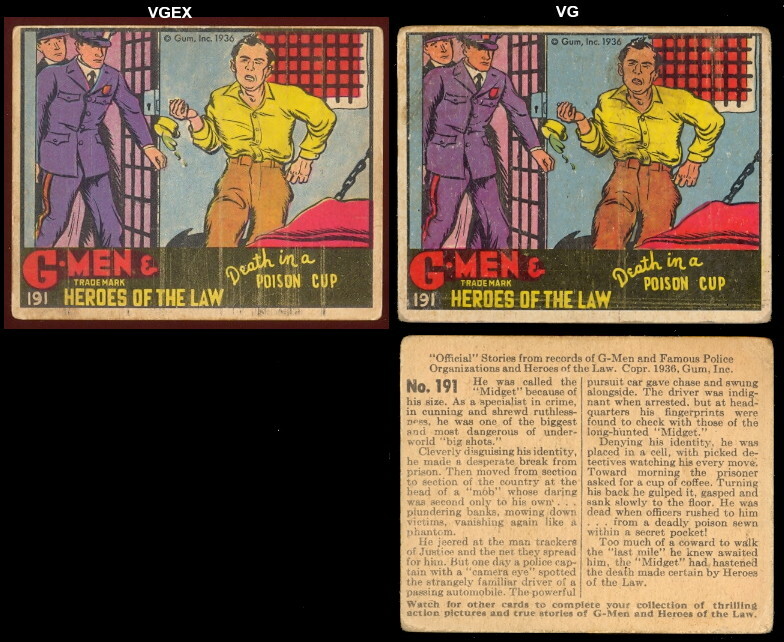 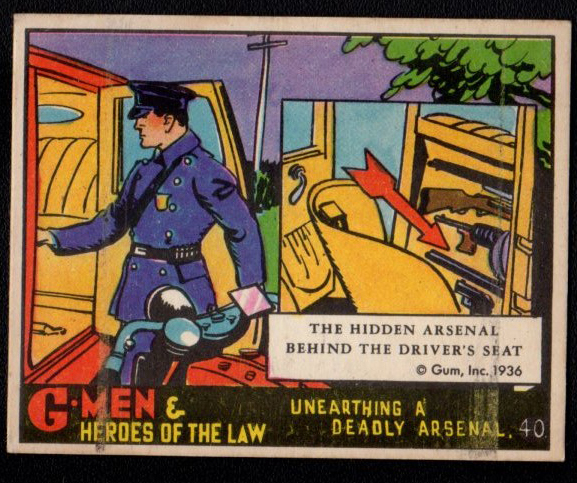 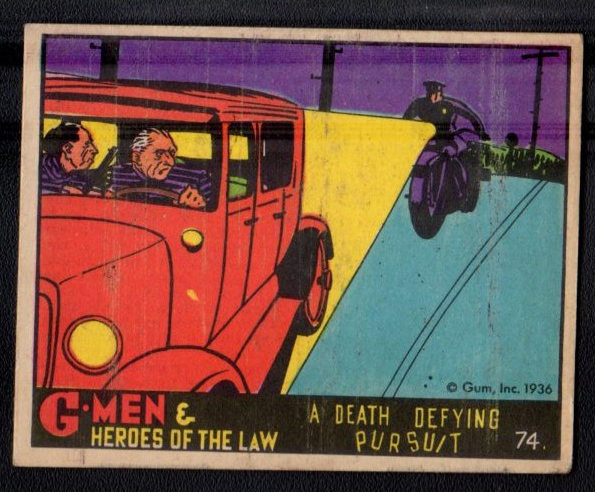 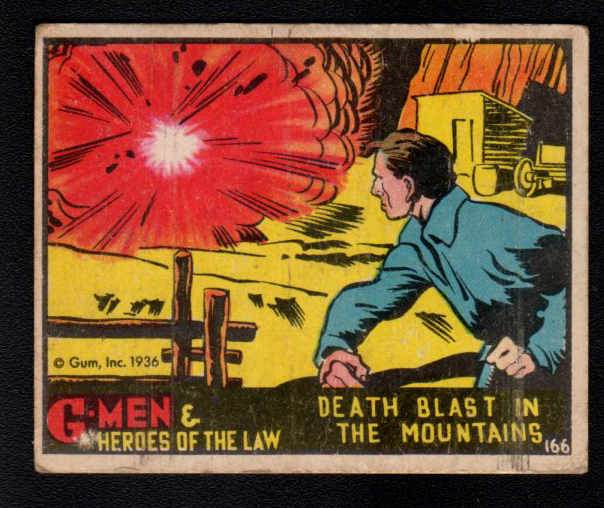 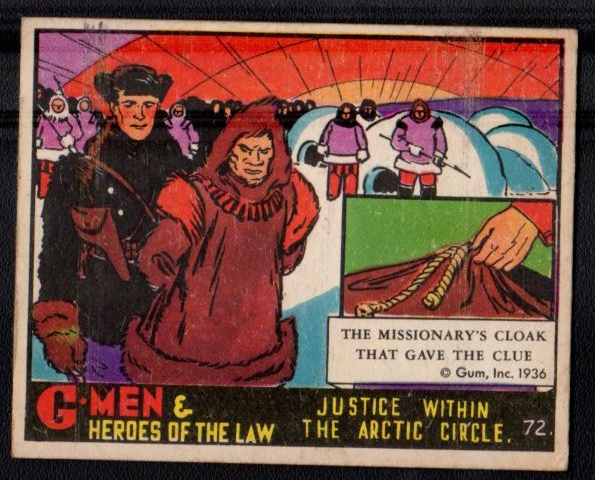 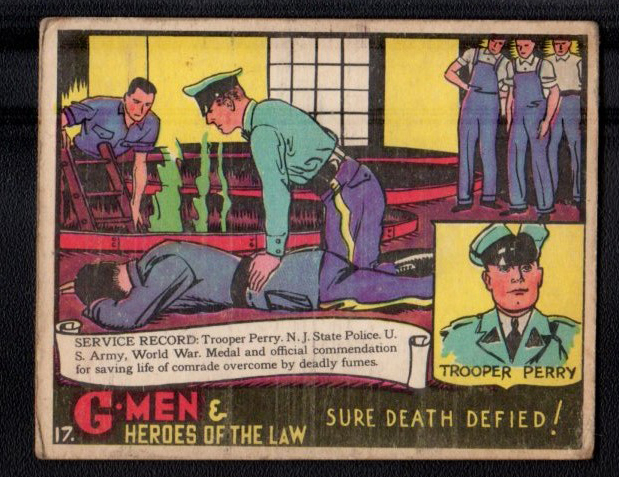 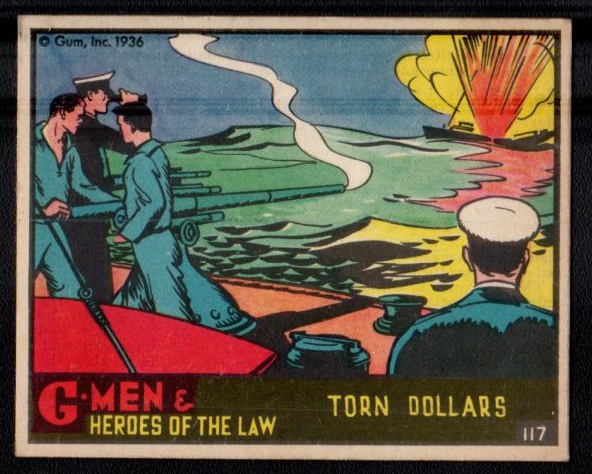 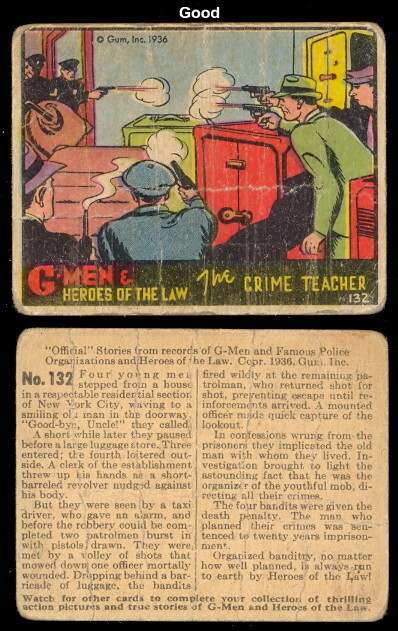 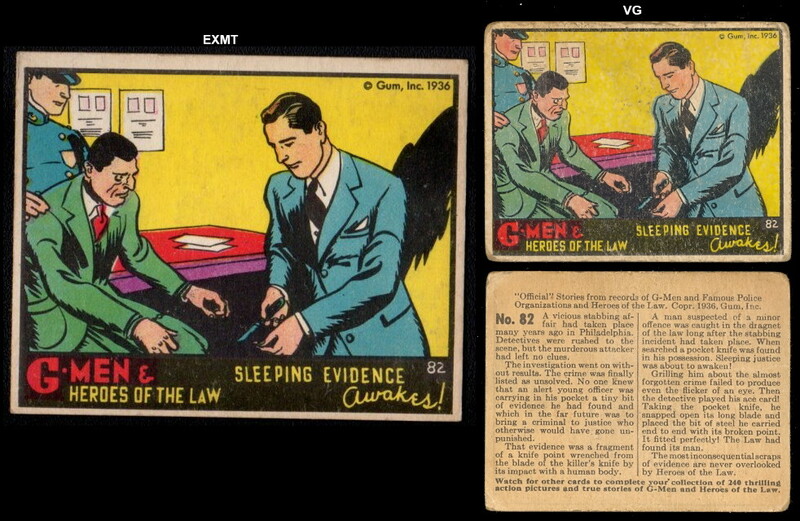 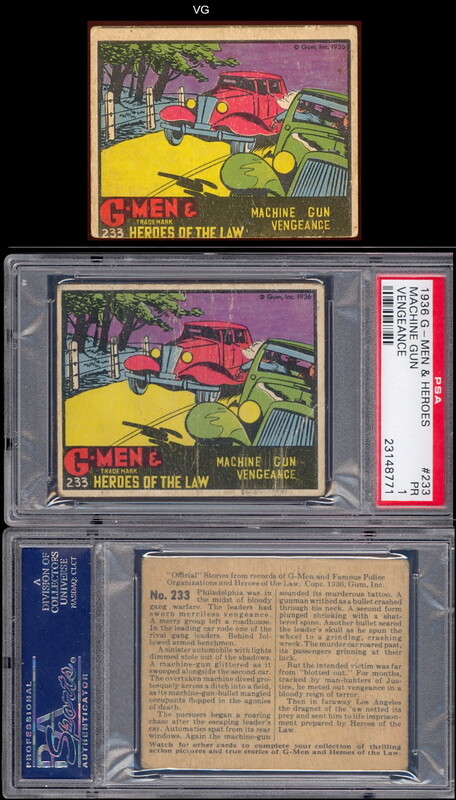 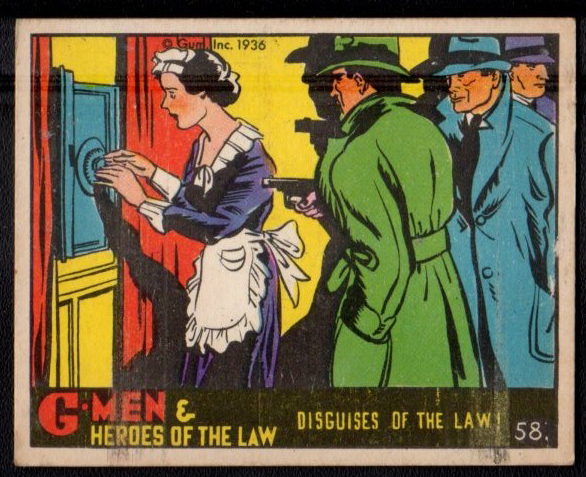 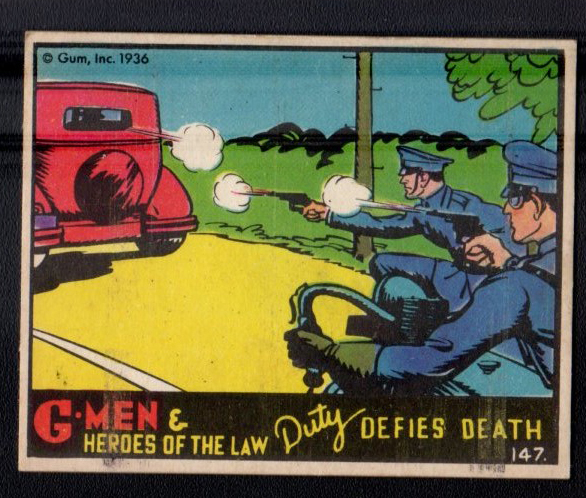 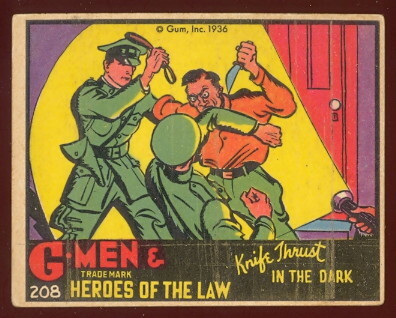 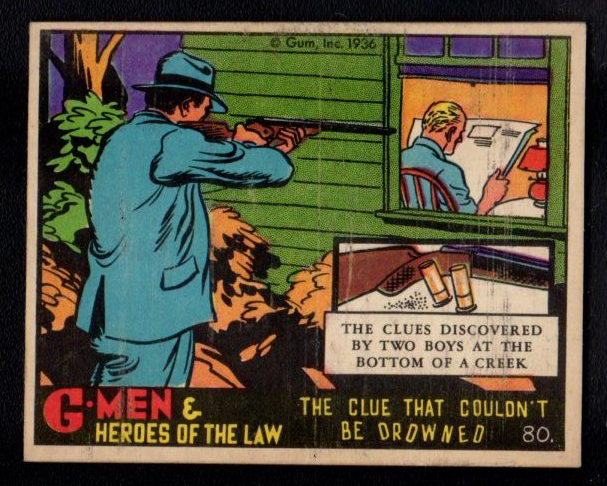 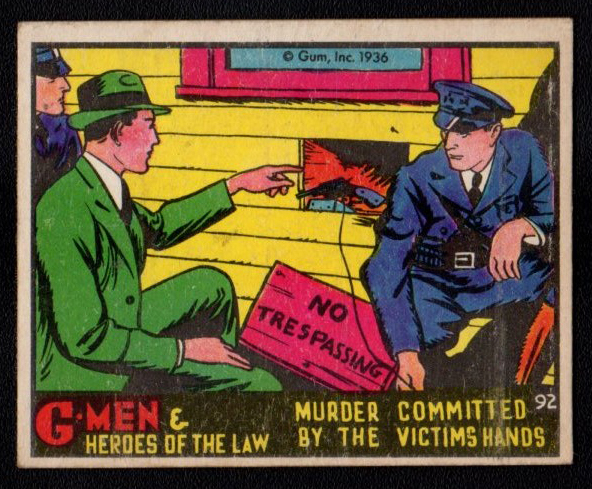 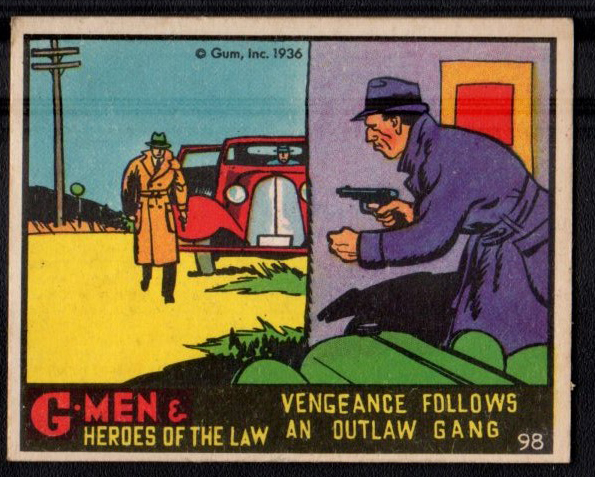 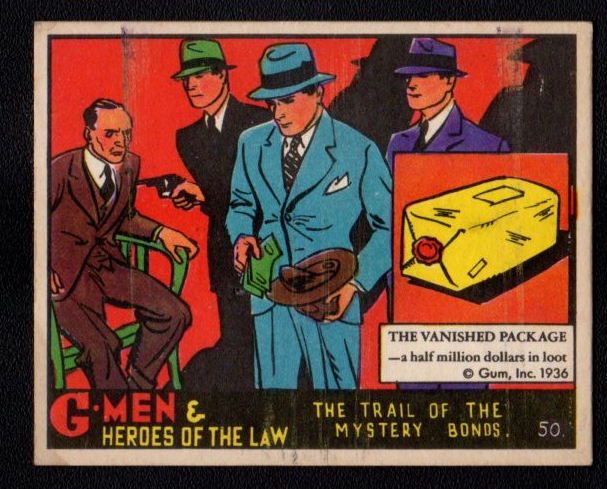 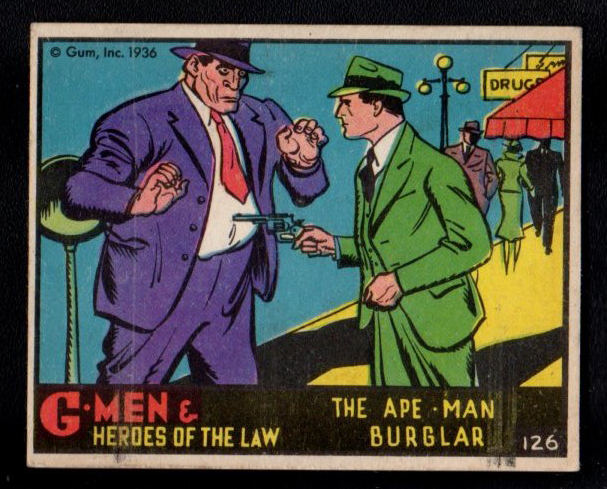 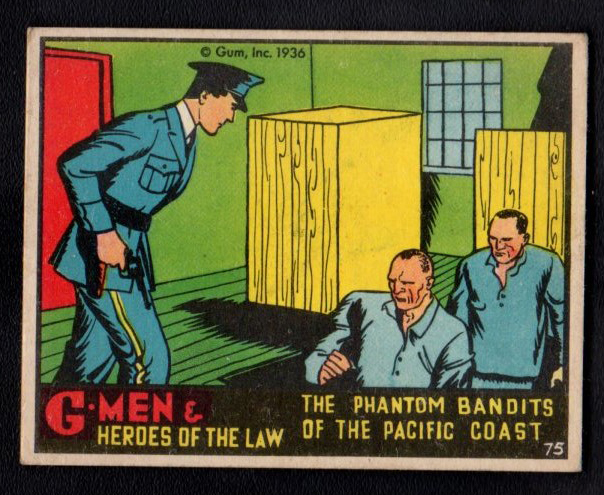 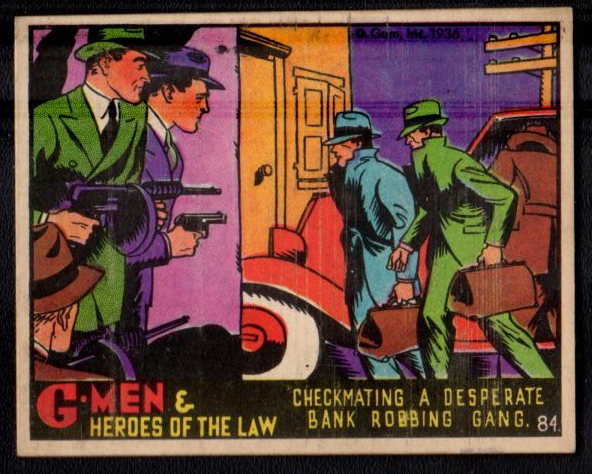 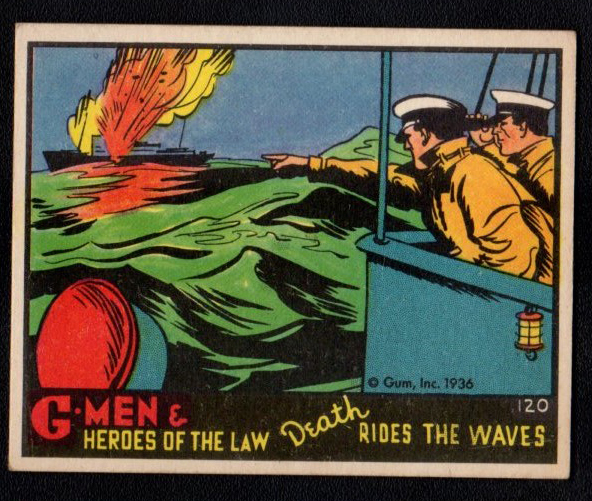 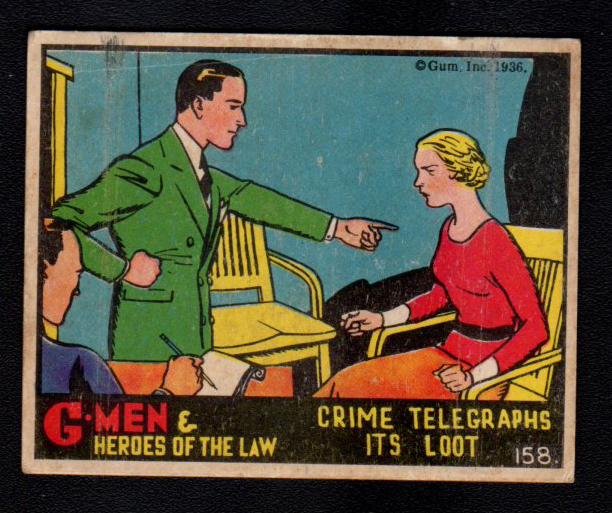 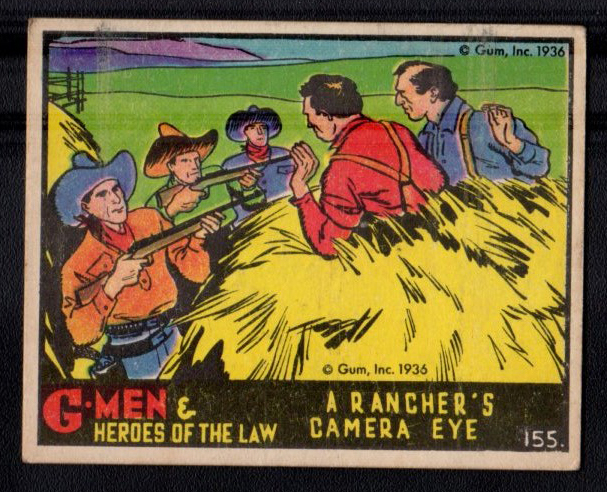 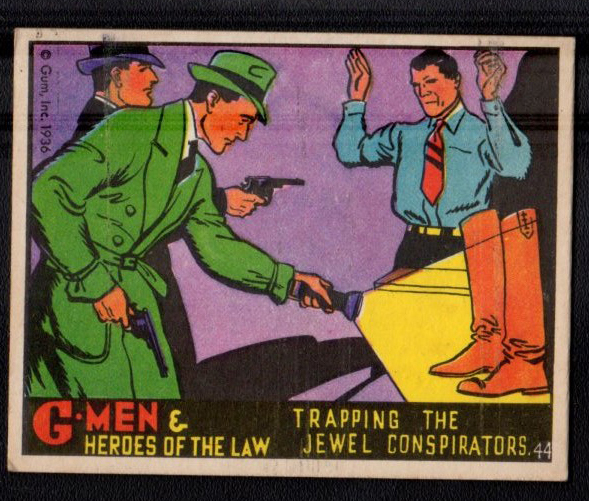 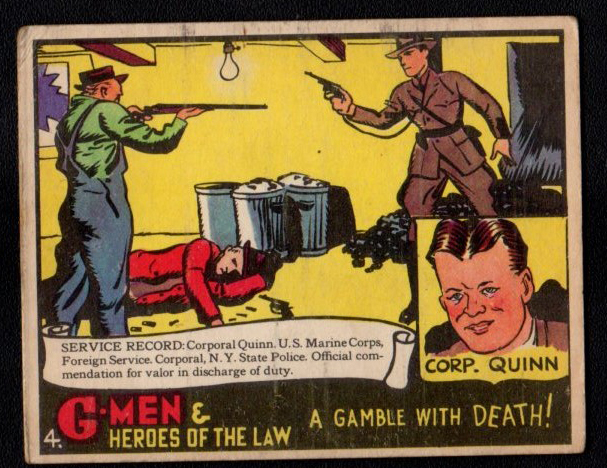 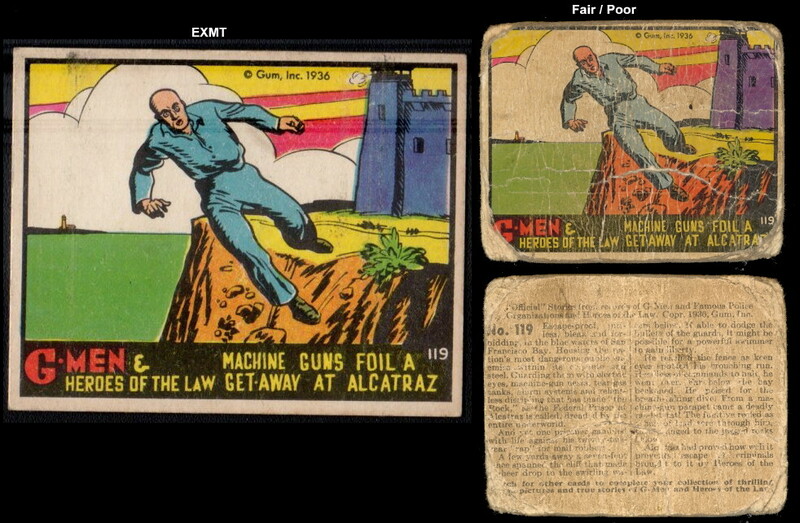 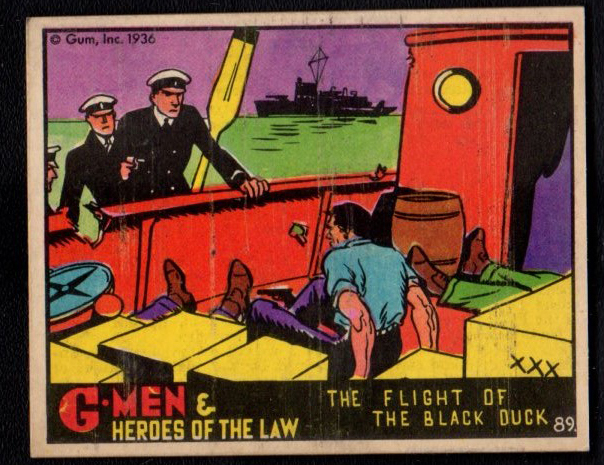 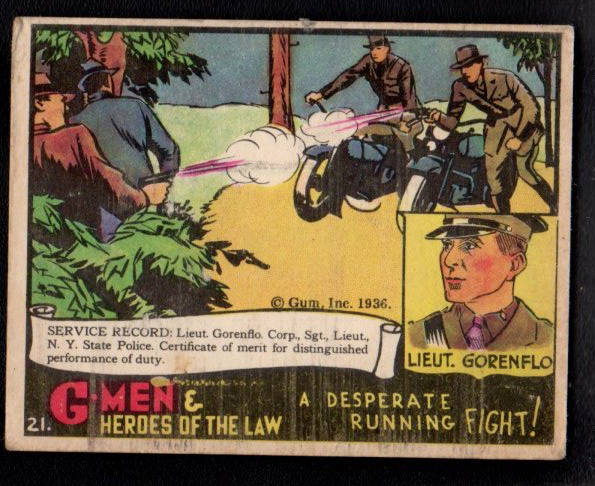 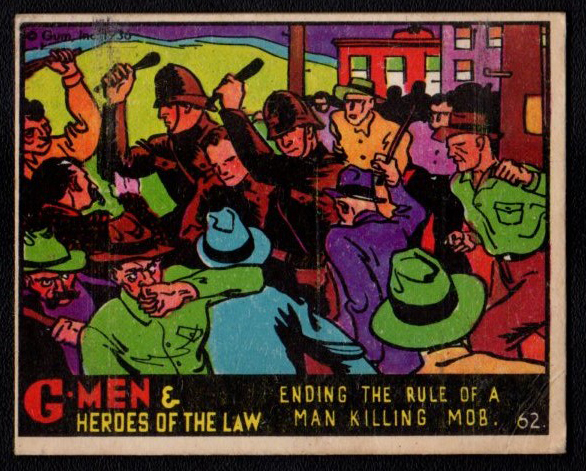 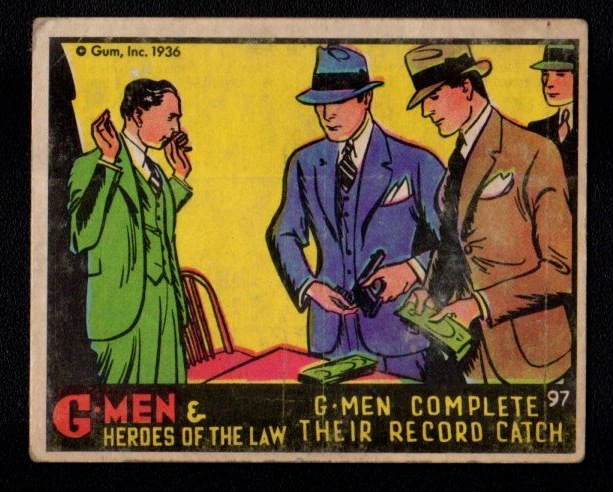 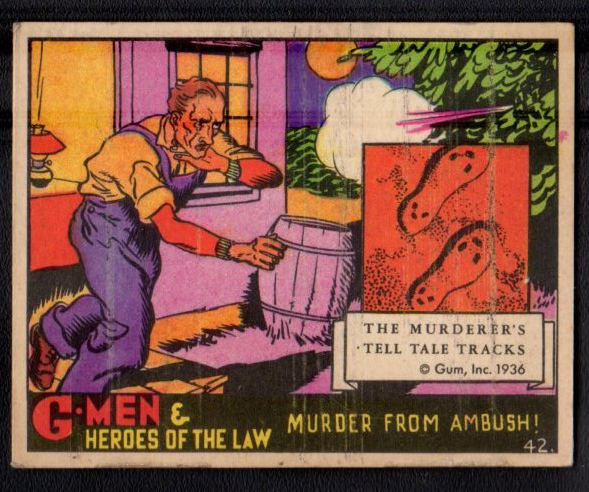 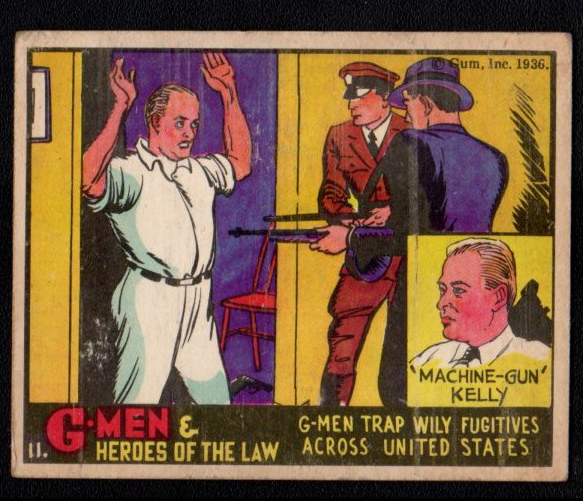 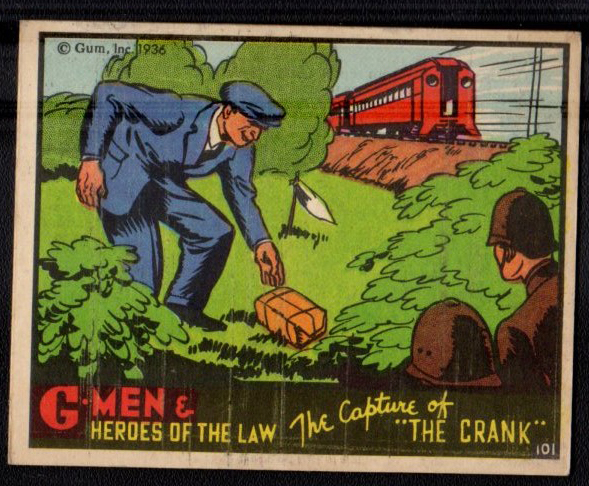 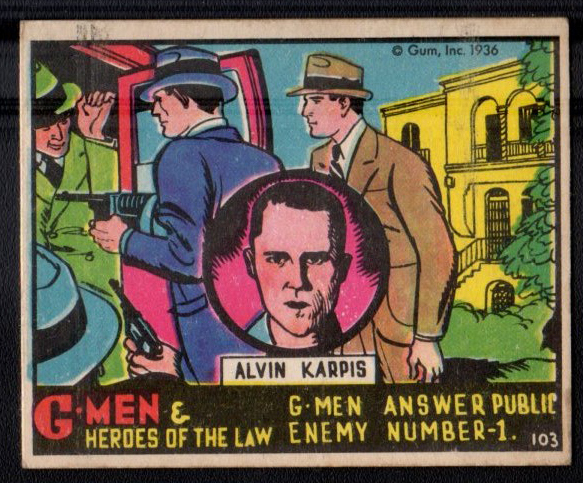 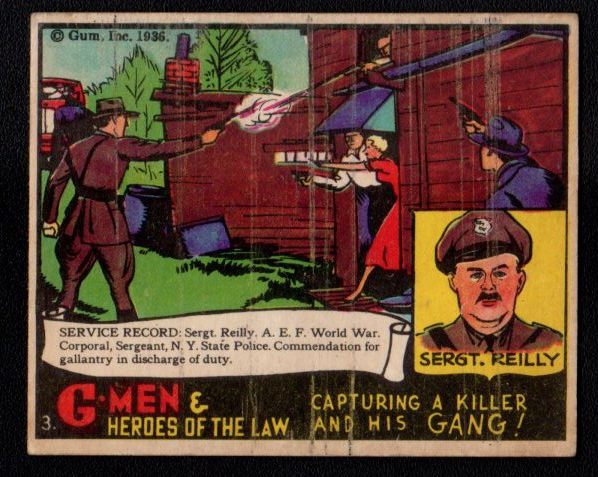 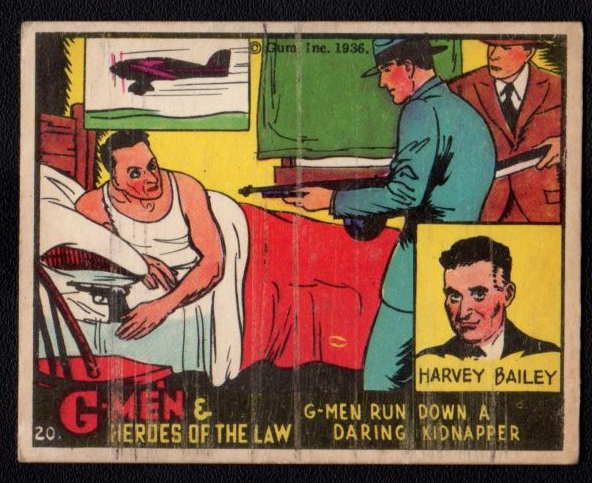 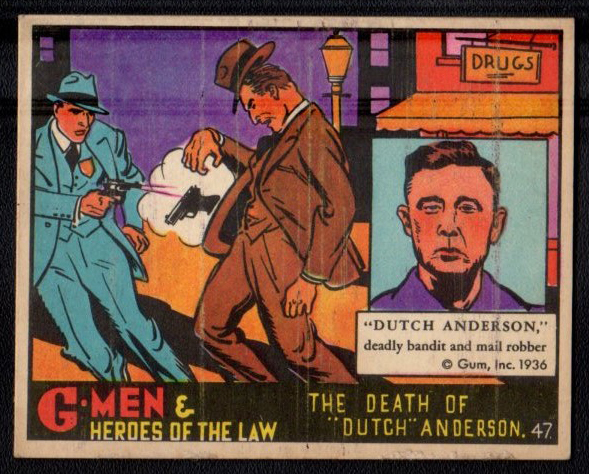 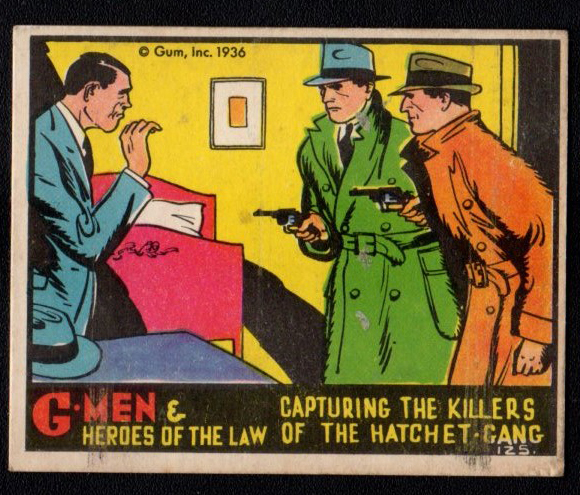 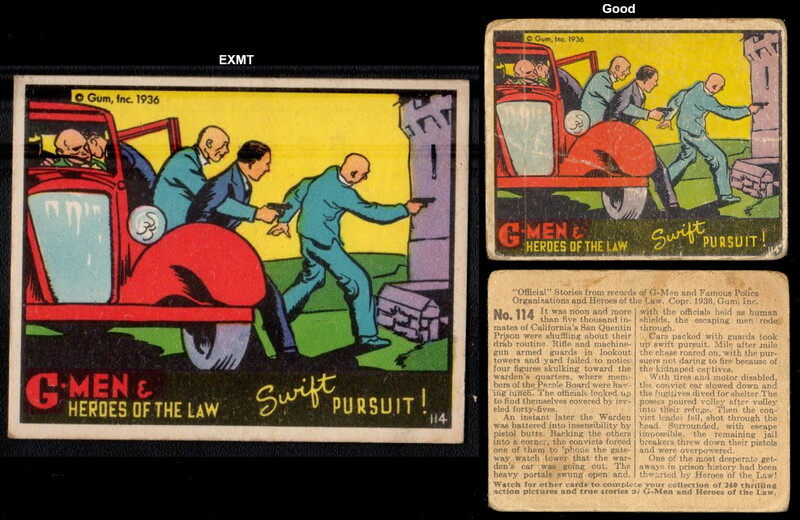 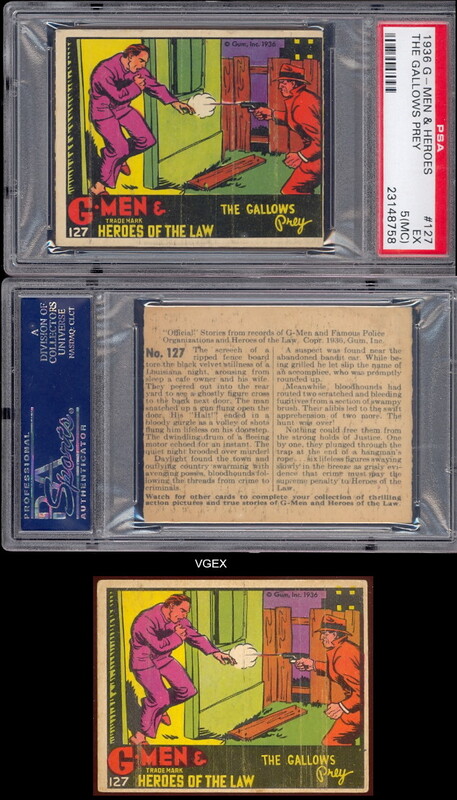 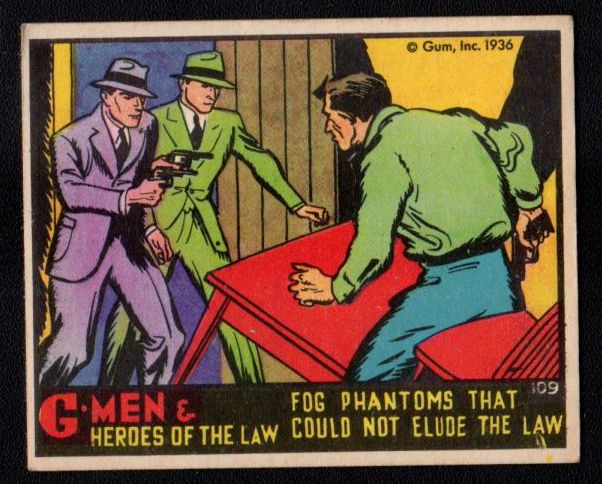 The 1936 Gum Inc. G-Men and Heroes of the Law set is one of the more popular non-sport card issues from the 1930's. 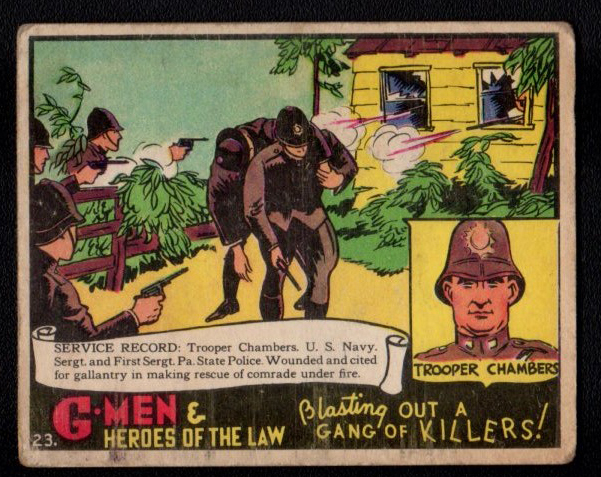 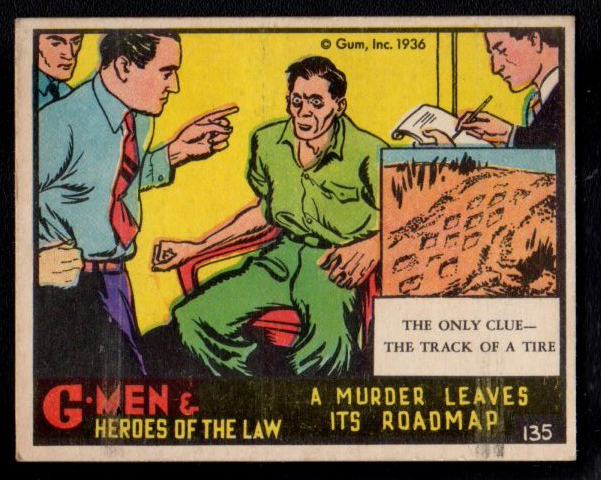 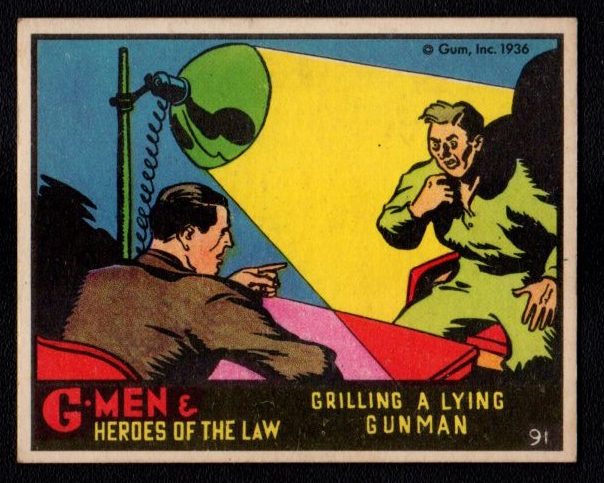 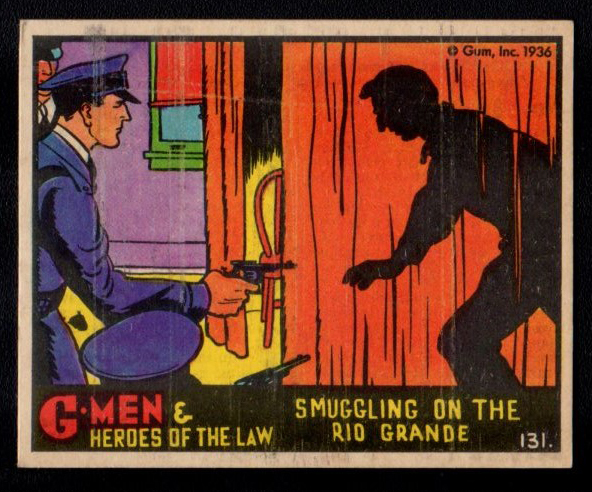 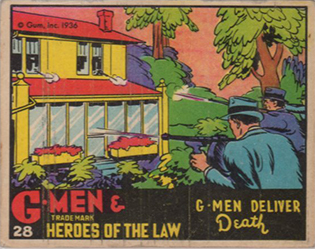 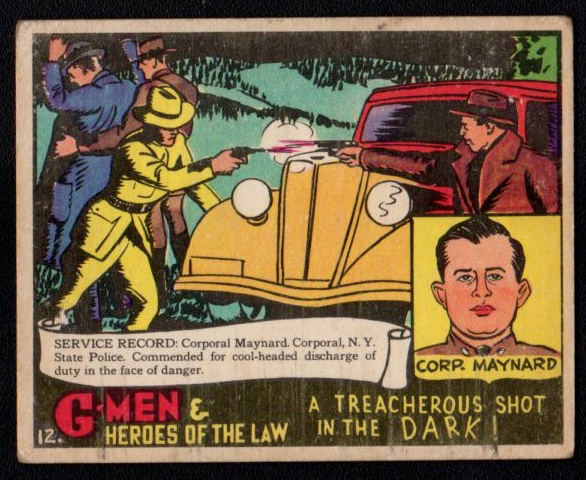 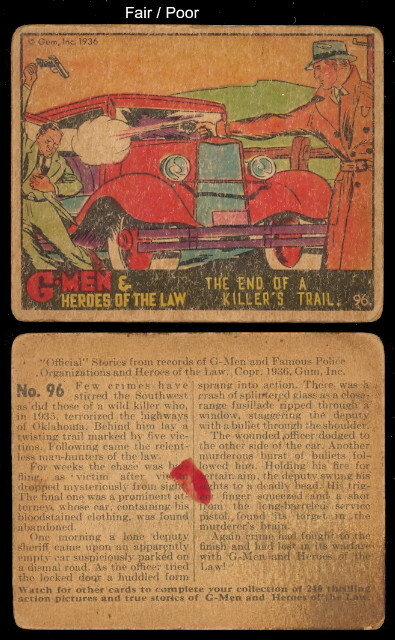 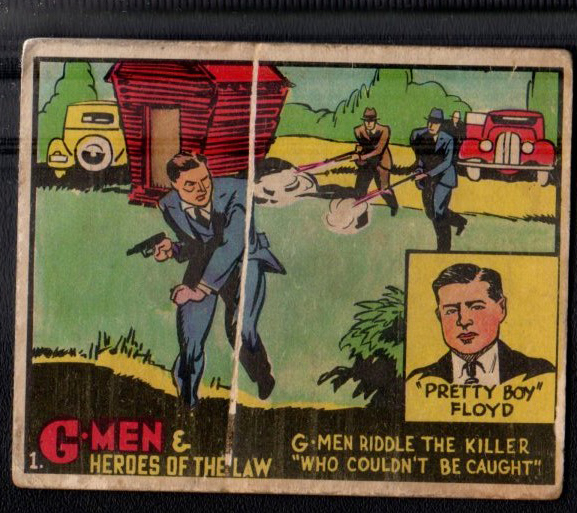 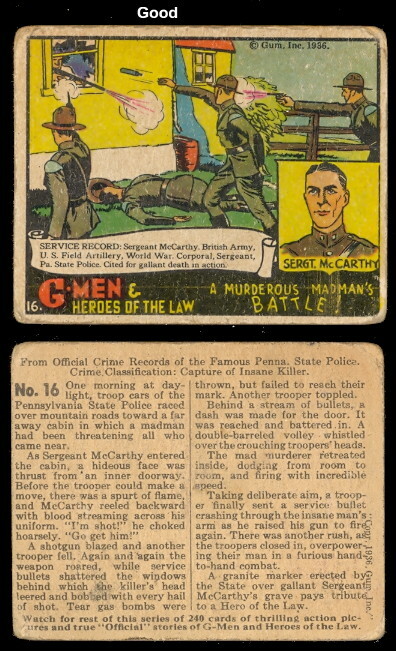 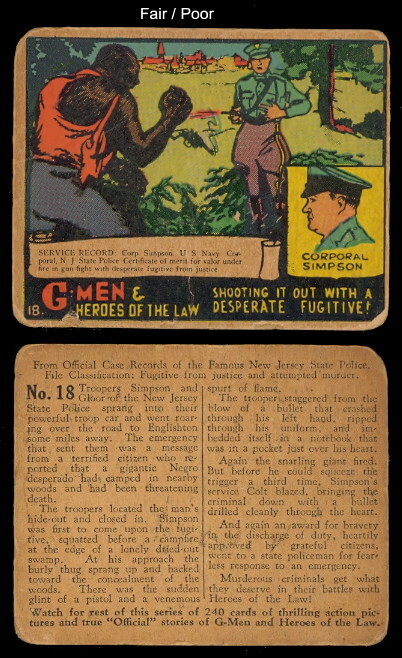 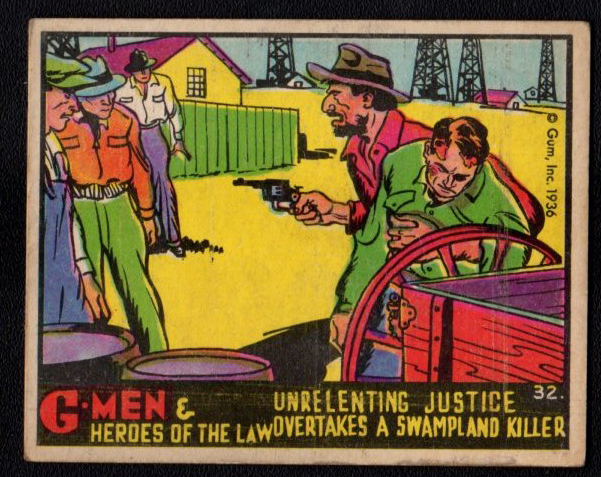 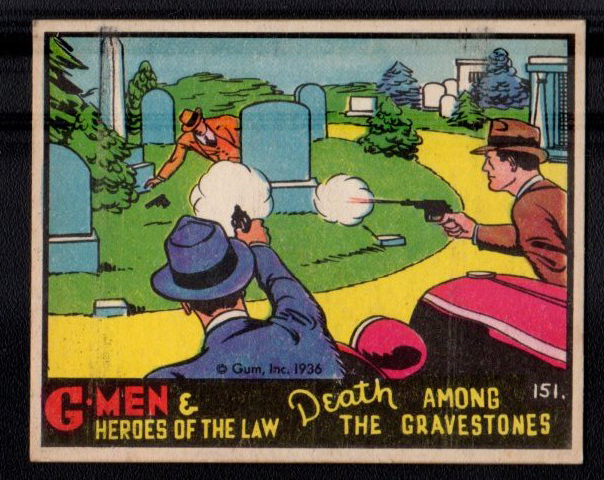 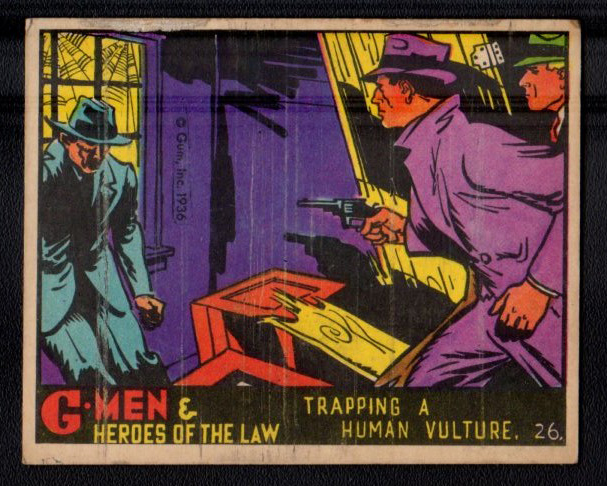 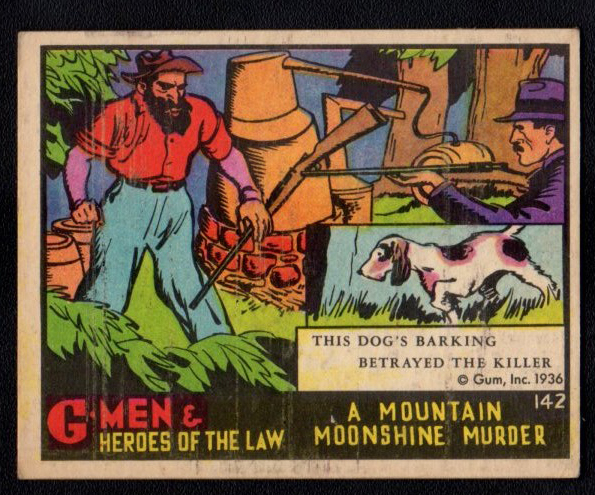 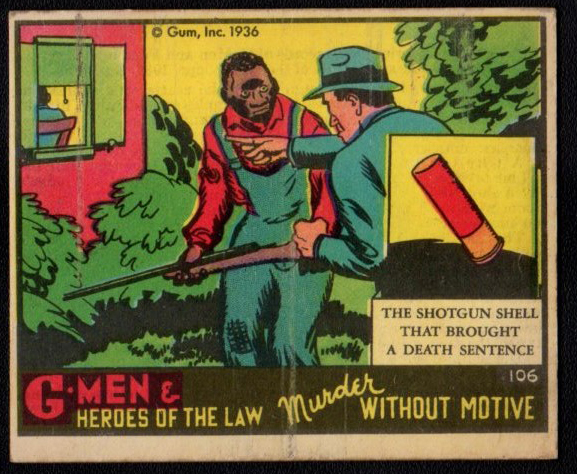 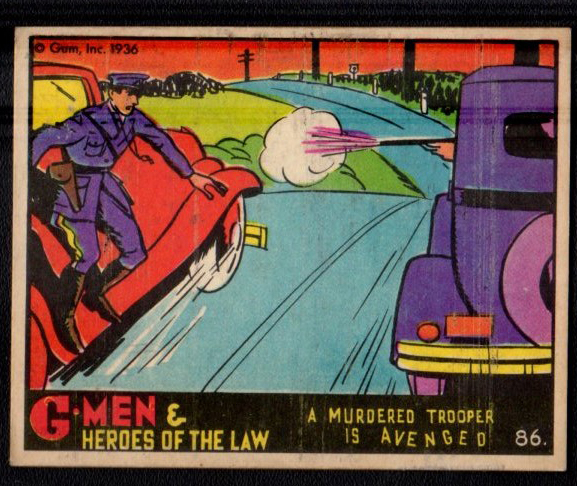 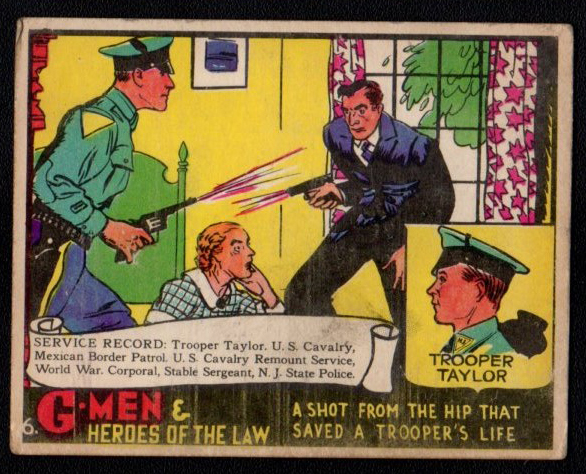 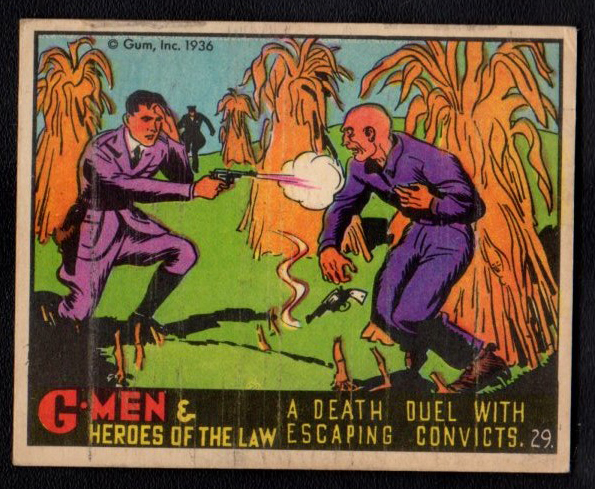 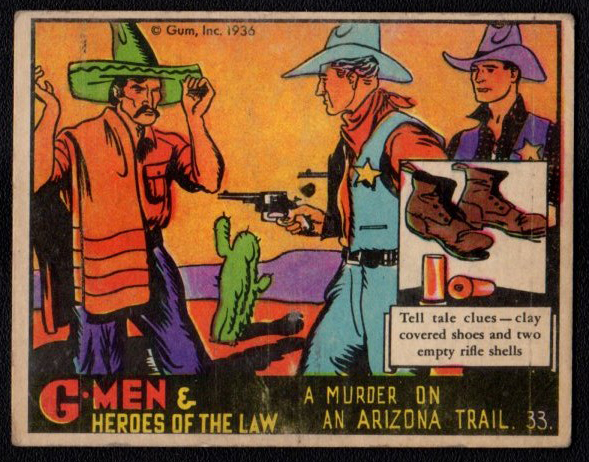 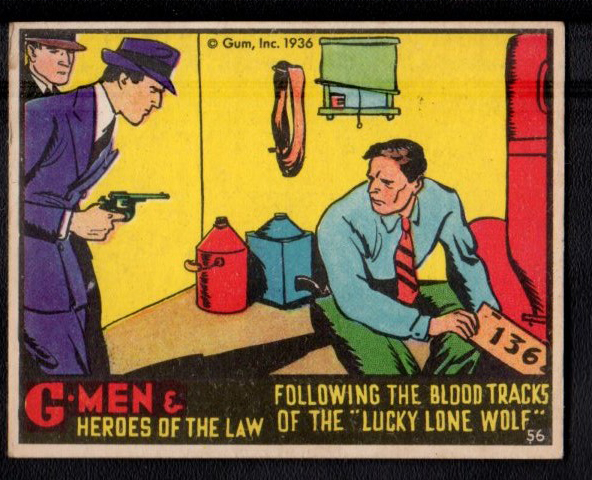 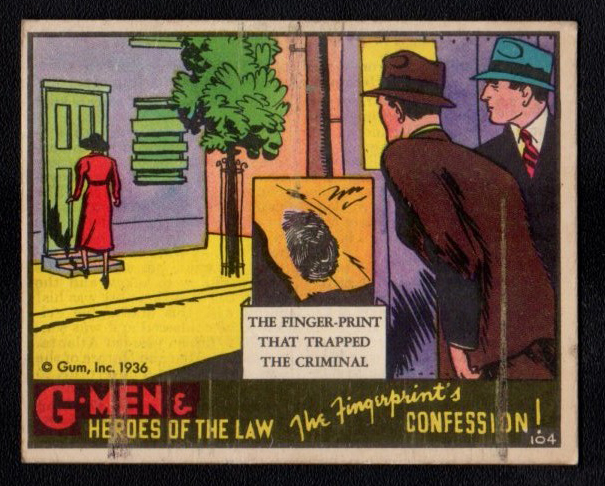 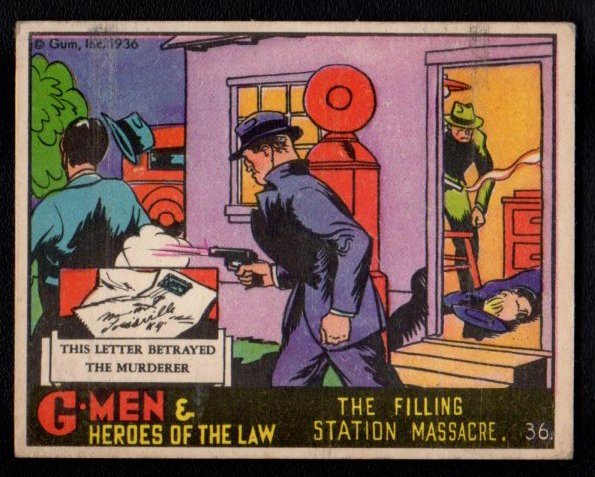 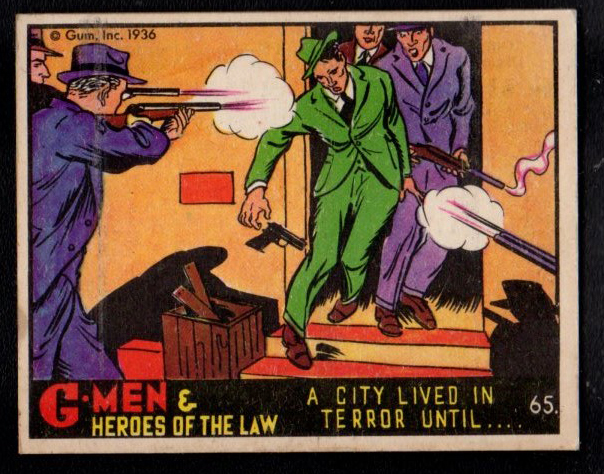 These cards feature scenes with G-Men and criminals in various incidents involving shooting, capture and death. 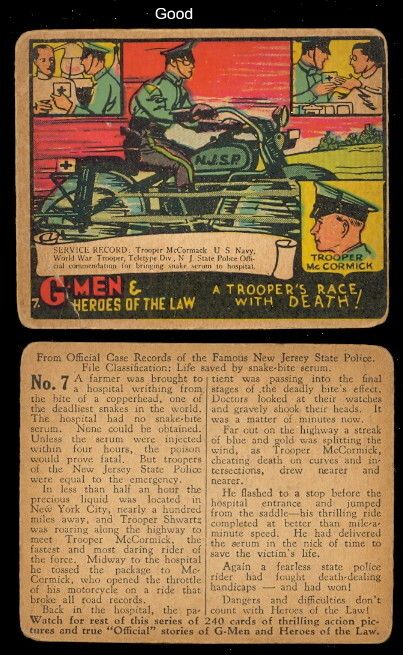 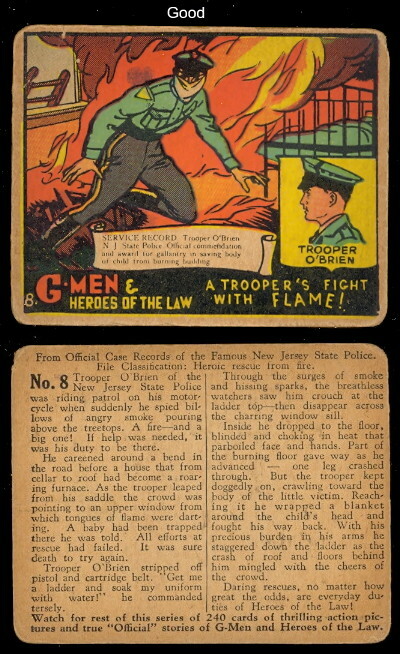 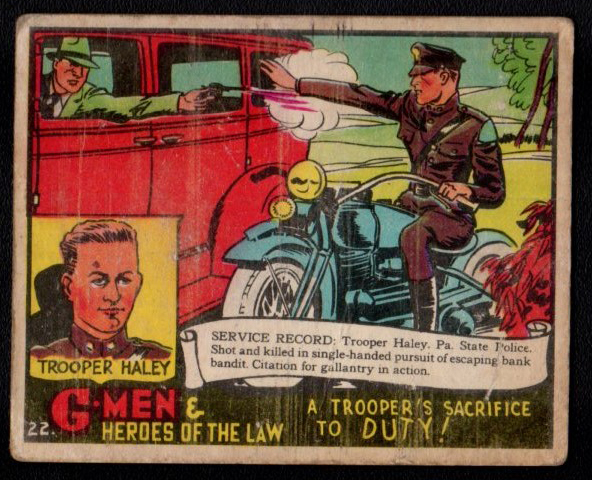 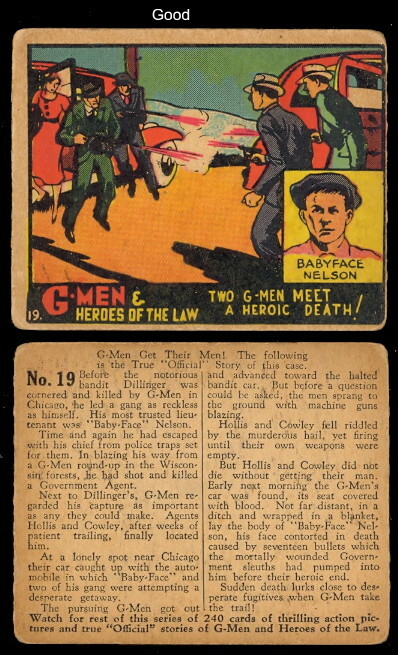 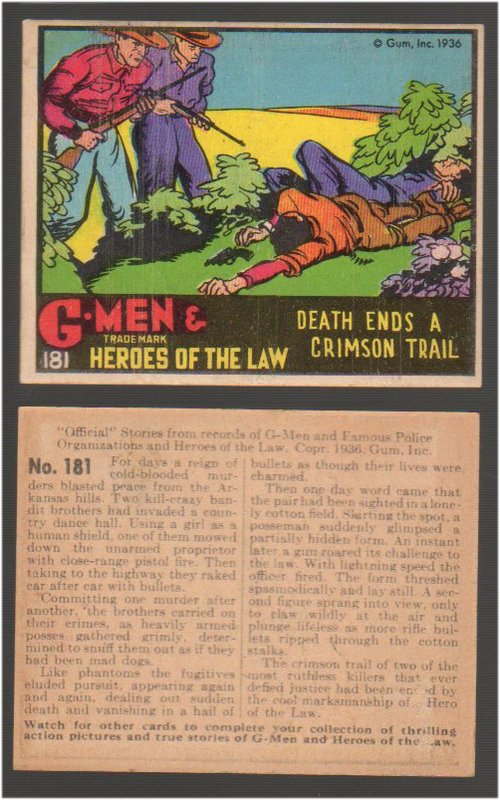 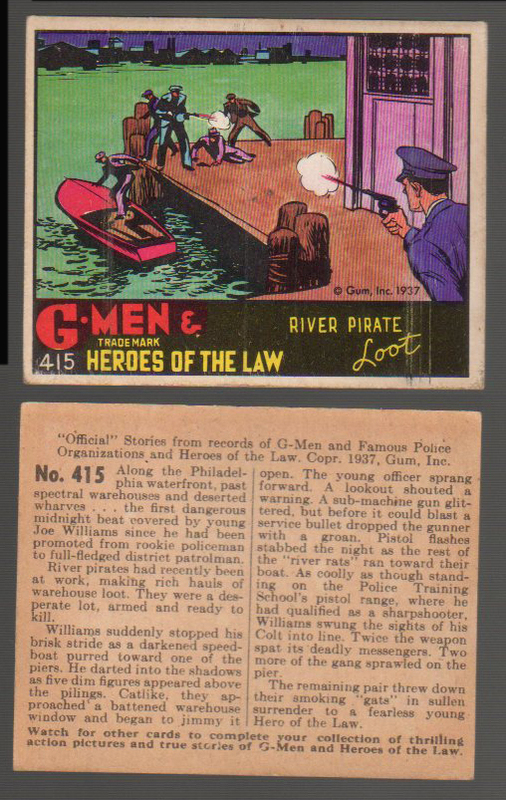 The cards state "Official Stories from records of G-Men and Famous Police Organizations and Heroes of the Law". 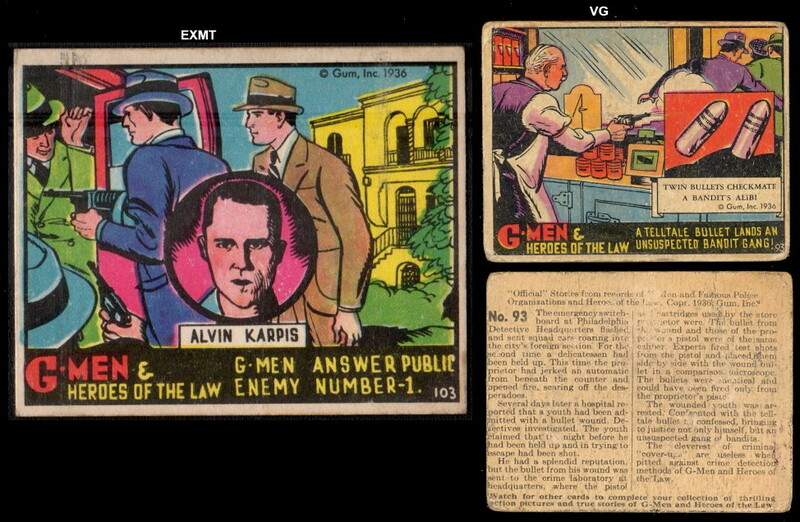 The set is listed as R60 in the American Card Catalog. 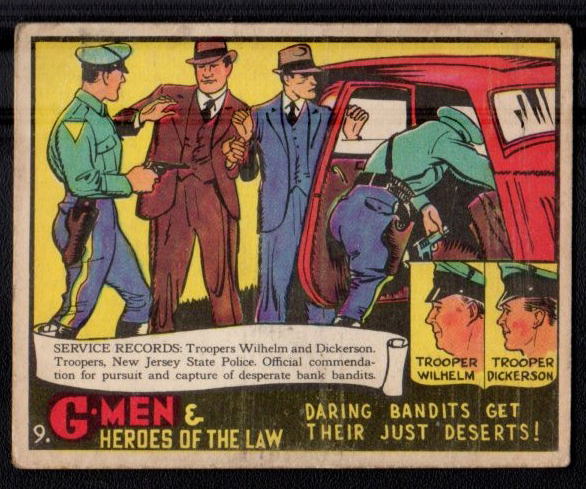 There are 168 cards in the complete set and the cards are skip numbered. 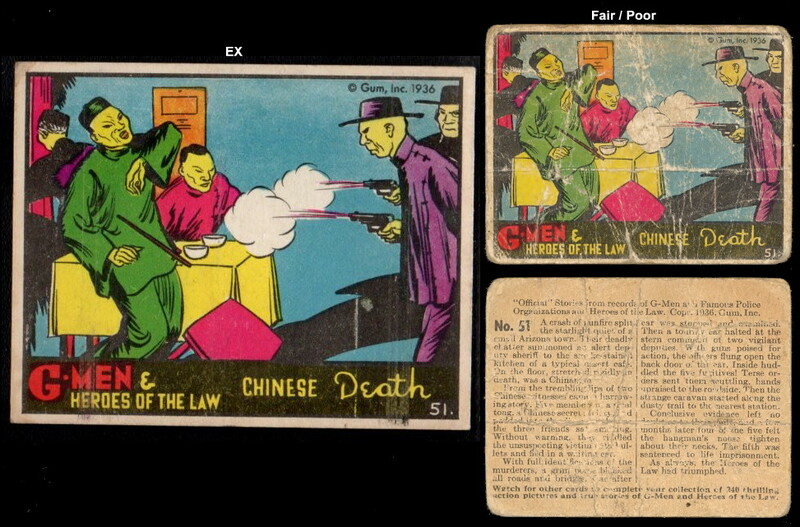 There are many scarce cards in this set including the very tough high numbers (above number 200) plus several near impossible lower number cards. 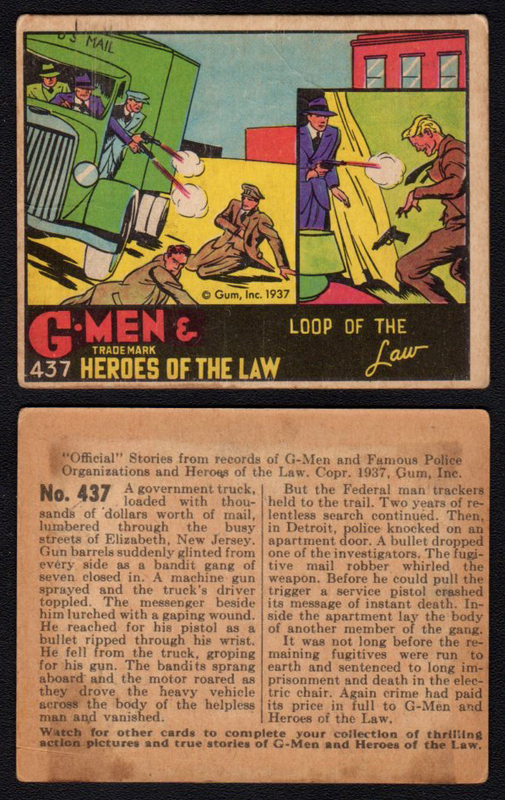 The fronts have action color drawings and the backs have descriptive stories. 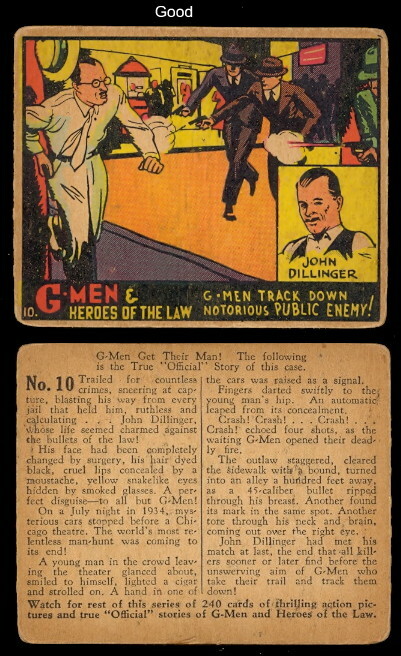 Some of the famous or infamous included in this set are Pretty Boy Floyd, John Dillinger, Machine-Gun Kelly, Babyface Nelson, Dutch Anderson, and Alvin Karpis. 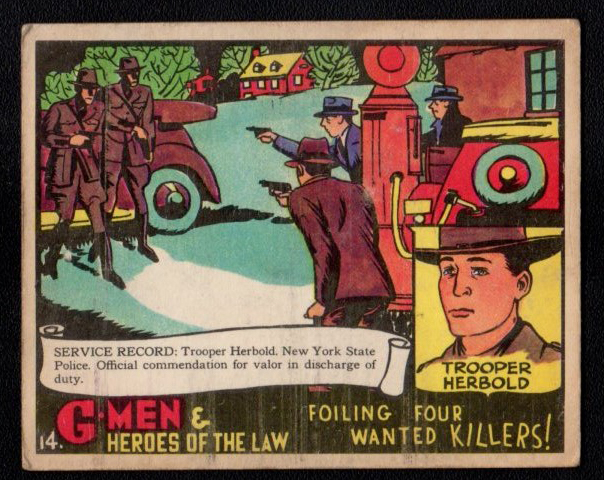 The cards measure approximately 2-1/2" by 3" in size. 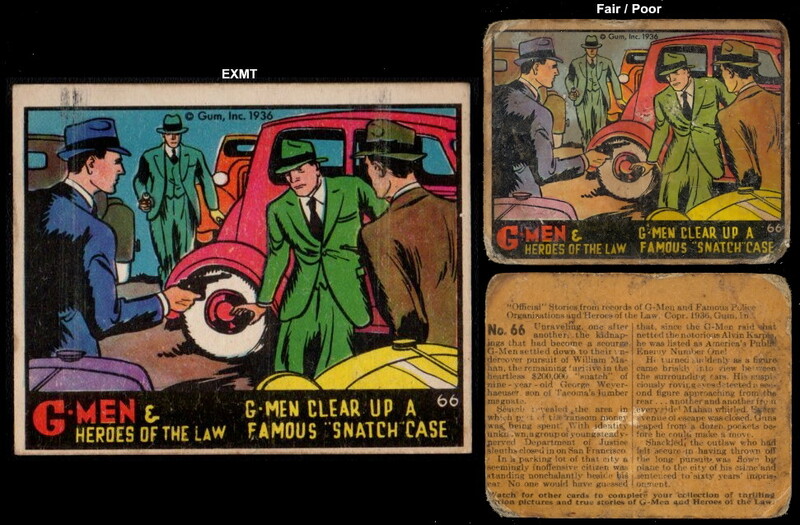 A very popular set! 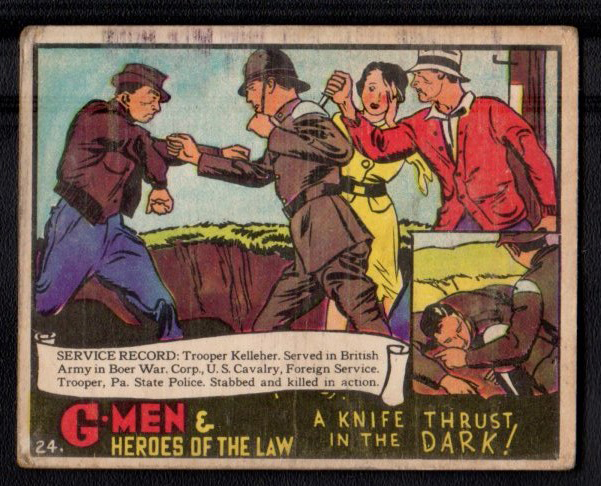 24 A Knife Thrust in the Dark! 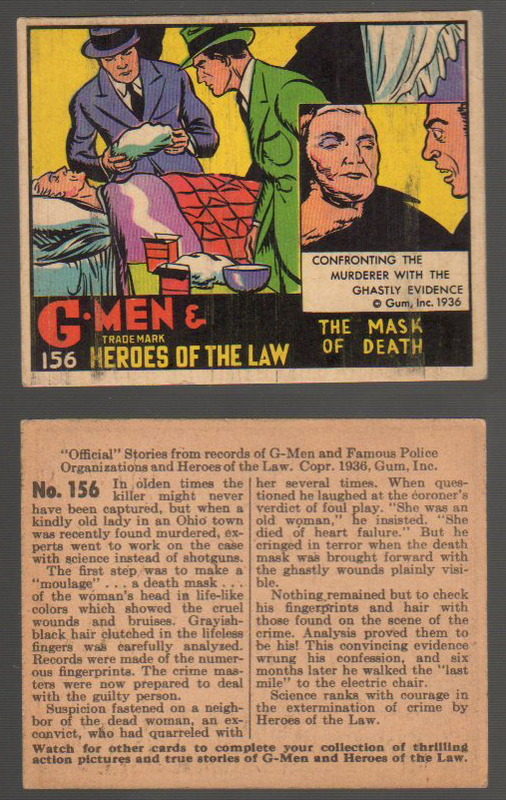 58 Disguises of the law! 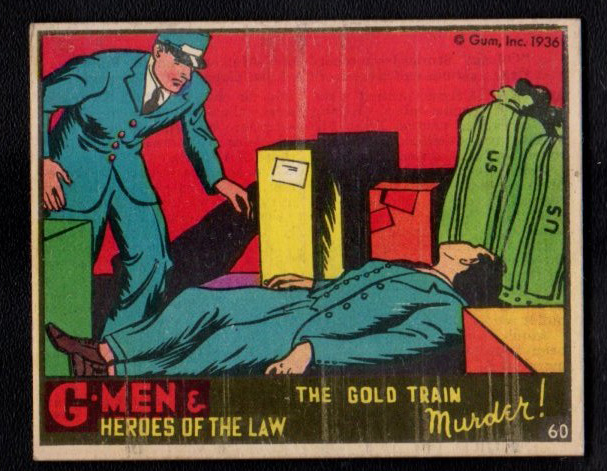 60 The Gold Train Murder! 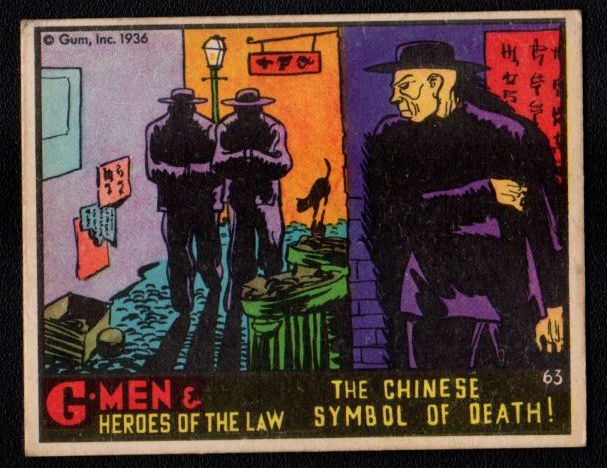 63 The Chinese Symbol of Death! 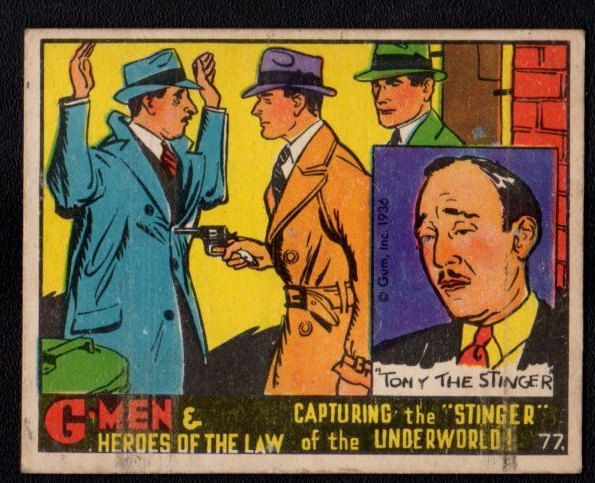 77 Capturing the Stinger of the Underworld! 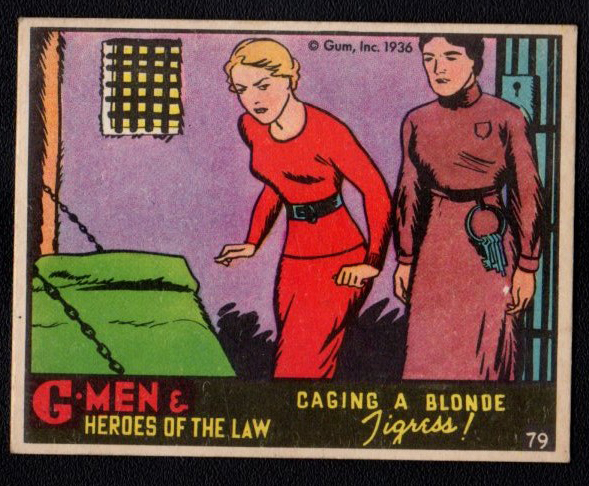 79 Caging a Blonde Tigress! 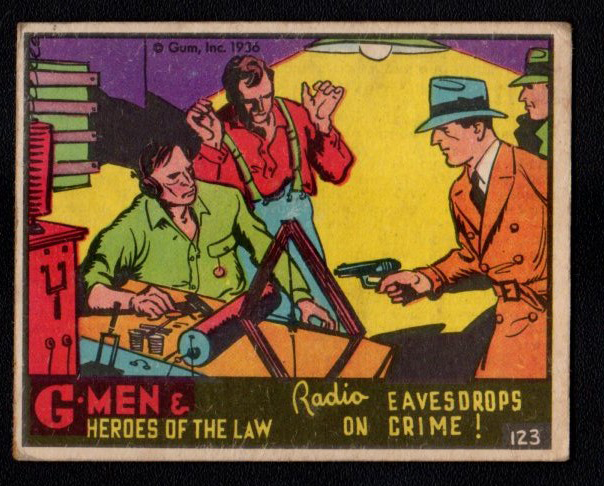 123 Radio Eavesdrops on Crime! 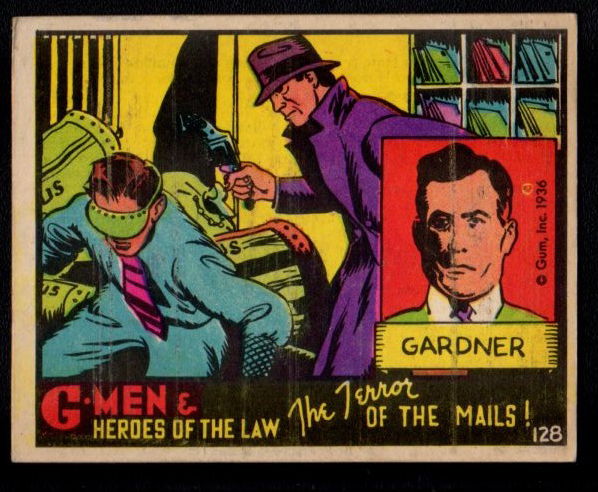 128 The Terror of the Mails! 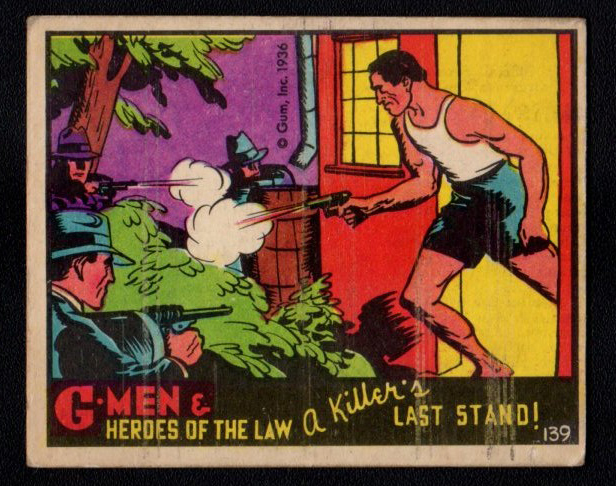 139 A Killer's Last Stand!